With increasing demand in housing and upscale in real estate sector, Delhi/NCR has emerged as one of the finest places to live by. People have been searching aggressively and keen towards the image of their ideal home. But one problem that people are facing in common is getting ready-to-move-in flats under a decent housing residency. People either have to compromise on the surroundings of the location or the price of the residential unit. 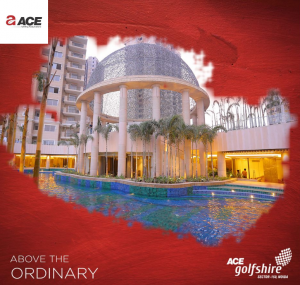 But one of the most successful names in construction sector, Ace has emerged as a savior for people looking to buy luxurious apartments in sector 150 Noida with its new ready-to-move in project named Ace Golfshire. This lavish residential complex aims at providing a better housing experience to every buyer’s need. Offering 2 & 3 BHK apartments equipped with all modish amenities in place, this project was delivered within its promised date and have won hearts of an ideal home seeker. Surrounded with green landscapes, the project promotes green living with proper eco-system and ventilation provided with each and every residential unit. The project also features a club house with swimming pool and special area for kids. The project also provides easy convenience with all major places in town and Delhi/NCR. Adding more to pamper your comforts, the location stands nearest to schools, hospitals, entertainment hubs and much more. The makers have assured facilities like departmental store, medical store, salon and other urgencies inside the project only. Ranked amongst producing the best flats in Noida Expressway, the project still aims at providing home to each and every seeker in nation without burdening their pocket. Ace believes that owning a home is something we all deserve but sometimes we compromise on our choices because of the one major factor, money. And this the change construction sector needs with time.